Condo, 3 Bedrooms + Bunk Area, 3 Baths, (Sleeps 8-10), Large Community Pool! Located on the most magnificent 20 mile strand of white sugar sand beaches you could possibly imagine, and one of the best kept secrets in the world - THE BEACHES OF SOUTH WALTON. Awaken each day to a natural, unspoiled coastal environment with clear turquoise waters and thriving native Sea Oats, Crepe Myrtles and Palmetto Plant life that truly make this area a 'BEACH PARADISE'. This Ocean-front unit on the third-floor of the Monterey Condominium Complex offers spectacular views of the sparkling Emerald Waters and breathtaking Sunsets. One of 24 luxury units directly on the beach. 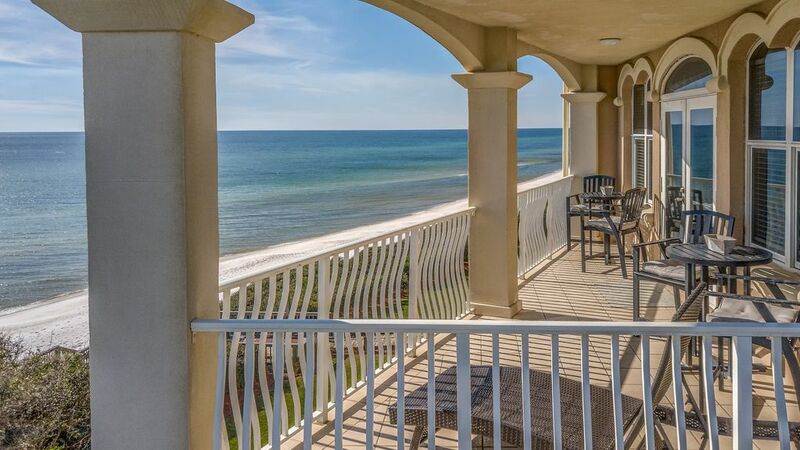 This condo is situated between Panama City Beach and Seaside Village on Scenic Highway 30A, near Rosemary Beach, Seagrove Beach, Water Color, and Water Sound. The master KING suite has a separate entrance to balcony, large whirlpool tub, his and her vanities, separate shower, and a large walk-in closet. All bedrooms have flat screen TV's. The second bedroom has a Queen sized bed. This room features a private bathroom and a large walk in closet. The bathroom has a tub/shower combo and a single vanity. The third bedroom has a King sized bed. It has a private access to the hall bathroom. This bathroom has a tub/shower combo and a single vanity. Additional sleeping is provided in the hall way with a small bunk area. This bunk area has two twin beds and sleeps two. The spacious living area has incredible views of the Gulf of Mexico along with the expanded oversize balcony with plenty of room to entertain or spread out and watch the emerald waters and sugar sand beach. Full access to the Monterey pool which is seasonally heated. Enter through a security gate to the parking area. This Non-Smoking condo is one of only twenty four units in the complex and has elevators and stairways for easy access. We have decorated this unit in bright coastal colors with a seaside motif for your enjoyment. The unit is fully-equipped to afford you all the conveniences of home away from home. It will be a vacation that you and your family will long remember. Our goal is to make your vacation as enjoyable and relaxing as possible so that you will want to make our home your home away from home each time you vacation on South Walton's beaches just as generations of families return year after year. Over a dozen golf courses are within a short distance, and restaurants and shops are located all along Hwy 30A or venture out to Silver Sands Outlet Mall, Destin Commons, Pier Park and Panama City is only minutes away. Several grocery stores and excellent dining facilities are just minutes away. What should you bring? ....... Beach items such as toys, beach towels, beach umbrellas, chairs etc. and the desire to have the best time of your life. Umbrellas and beach chairs are not furnished but are available for rent on the beach. 3) CONSTRUCTION IS IN PLACE ALL OVER 30A. We cannot be held responsible for construction near the home. There is currently construction next door. 4) During Summer weeks May to August, we require a seven night stay with Saturday turns only. There are many vacation rental companies for you to choose from. Some are big, some are small. Some have an enormous inventory, and some are local. So what makes us different? Two people. One dream. And not just any dream. A dream to live at the beach and create something they can build and care for. Caring, the most important thing. Because many companies can say they have great service. But not many can say they care the way two people with a dream can. Jim & Camille Dixon began investing and renting their personal 30A homes in 2004. Seven years later they realized their deep passion for the boutique vacation rental industry. Jim & Camille moved their family of four to 30A in 2011 to open 30A Escapes. They started the company with only 2 Clients. Today 30A Escapes is prominently known as the Top high end management firm on 30A. 30A Escapes wants to assure you that we will care for your needs, your wants, and everything in between. We will care for you because we all have dreams. Bar height patio table w/chairs high enough to easily view ocean over the balcony rail. Also lounge chair with foot stool. There will be roof maintenance to this condo’s building in late April and May. Rates have been adjusted to compensate for this work. No discounts will be provided for unforeseen disturbances that may arise during this time. Great place for our family vacation. Beautifully decorated condo. Plenty of room for our family and visitors. Beautiful view of the ocean. The bunk area was perfect. The large pantry was one of the best features. I forgot our crock pot. There was one in the pantry. We did have a leak in the kitchen sink. Texted Abbey and she responded immediately. There are a few suggestions. Nothing big, but would be helpful for future guest. There is no carpet in the condo. So, dirt and sand is a problem especially with little ones crawling on the floor. There is a small vacuum, the brush does not spin, so does not pick up great. There is no mop or broom. I had a friend bring me her swiffer wet to clean our floors. FYI if you have grandparents coming with you. There are 50 steps to get down to the beach. The 50 going back up with beach stuff could be a challenge. Thank you for your feedback. We are happy to hear that you like the condo and that we were able to get the leak fixed for you. We will make sure to replace the vacuum and the broom/mop as those are much needed items for our guests. The property is very nice and we really enjoyed our stay! The bunk bed room and patio could have been a little bigger but other that that it was great! This was a "girls getaway" and it couldn't have been better! The management company was wonderful to work with from the time we booked. The condo was spacious, beautifully decorated and well equipped in every way. The best part was the view of the Gulf from our balcony - spectacular clear water and breathtaking sunsets every night. Wonderful beach and great swimming both in the ocean and the pool. We will definitely return! Thank you for your kind comments. Good reviews are always good to hear and I hope you will stay with us again in the future. This was our first visit to the area and we couldn't have picked a better location. The condo is spacious and very attractively furnished with many waterviews ~ our favorite place was on the balcony overlooking the beautiful Gulf waters - with a view of Panama City on one side and Destin on the other - from sunrise to sunset - spectaular ~ you will never want to leave! It is perfectly situated between the busier beach towns allowing you a very relaxing beach experience and onlya short drive to quaint shoppes and wonderful restaurants. We would "highly" recommend this unit for anyone who hasn't been to the area and is looking for a beautiful unit on the water - we were very sorry when we had to leave after seven glorious days and we do hope to be back next year for a longer stay!